"The deepest downturn in the U.S. economy since the Great Depression may finally shrink the gap between the very best-off Americans and everyone else. If so, it won't be by lifting up the bottom. It will be by pulling down the top." Quit fretting, was the underlying message. "These conclusions are just plain wrong." "Scholars have, with few exceptions, reached a consensus that Census Data is not appropriate for measuring high incomes. To ensure the privacy of individuals, the census assumes a maximum individual income of $999,000 or less. So, it does not capture the true income of oil traders or anyone else earning $100 million, $50 million or five million per year. Second, the Census data does not include capital gains, a central source of the wealth created in private equity and hedge funds." "Based on the US historical record, falls in income concentration due to recessions are temporary unless drastic policy changes, such as financial regulation or significantly more progressive taxation, are implemented and prevent income concentration from bouncing back. Such policy changes took place after the Great Depression during the New Deal and permanently reduced income concentration till the 1970s. 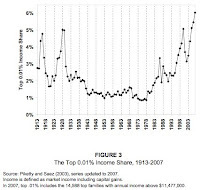 In contrast, recent downturns, such as the 2001 recession, lead to only very temporary drops in income concentration." "In a recent paper on tax policy prepared for the Hamilton project, my collaborators and I concluded from Congressional Budget Office data that, since 1979, changes in income distribution had raised the pre-tax incomes of the top 1 per cent of the population by $664bn or $600,000 per family – an increase of 43 per cent.By definition what one group gains from changes in the distribution of income another group must lose. The lower 80 per cent of families are $664bn poorer than they would be with a static income distribution, which works out to $7,000 less in income per family or a 14 per cent loss. To put this in some perspective, the total gain in median family incomes adjusted for inflation between 1979 and 2004 was only 14 per cent. If middle income families had shared fully in the economy’s income growth over the past generation their incomes would have risen twice as rapidly!" And on the day before the WSJ ran its story, the Center on Budget and Policy Priorities published a paper, entitled Top 1 Percent of Americans Reaped Two-Thirds of Income Gains in Last Economic Expansion. "My intense study of past history, which will soon be released in It Could Happen Here is in line with Professor Saez’s conclusion. 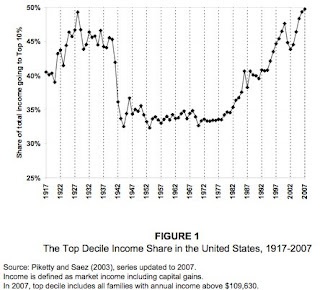 Once income concentration becomes a reinforcing cycle of the kind we are witnessing, it is never stopped by pure market forces. Only extensive government intervention, of the kind that will inevitably create high controversy, reverses this trend." "Certainly no President in recent times has so bitterly aroused the enmity of a whole class as Franklin Roosevelt has aroused the economically substantial element of the U. S. Regardless of party and regardless of region, today, with few exceptions, members of the so-called Upper Class frankly hate Franklin Roosevelt." What politician today can boast of such bravery? The will for reform is not dead today, but it certainly seems to be flagging, on the back of bouncing stock markets. Very worrying stuff. The secrecy jurisdictions - the strongest generators of economic inequality today -- have much to answer for.